It may sound odd that singing icon Basil Valdez, among the most distinctive voices in the history of recorded Filipino music, honed his talent mimicking others. He used to be a cover band vocalist. For good reason, he doesn’t really listen to himself and to other types of music save for his preference. “Hindi ako nakikinig para may sarili akong bitaw ng salita at musika kapag kumanta na ako,” he argued. 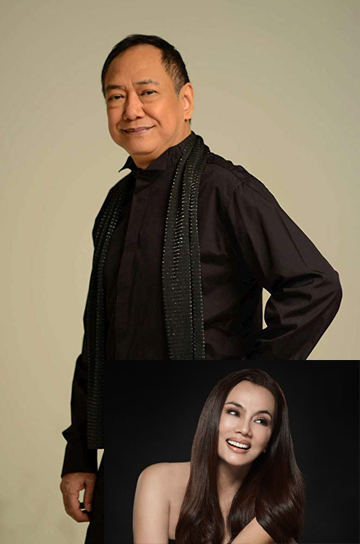 OPM icon Basil Valdez stages an intimate concert with Kuh Ledesma on Valentine's Day. Canseco produced Basil’s first album that also includes “Hanggang Sa Dulo Ng Walang Hanggan” and “Kung Ako’y Iiwan Mo.” As if having Canseco is not enough, he had other fateful encounters that solidified his status. In 1983, or six years since he started recording, Basil’s grade school classmate Gerry Paraiso suggested he sing something he wrote for his wife, called “You.” It was a brave move because at that point he had not scored a hit with English lyrics. Come his spot at Kuh’s dinner show My Unforgettable Valentine scheduled 6:00 p.m. on Valentine’s Day at the ballroom of Dusit Thani Makati, Basil will sing his classics and showcase chemistry with Kuh whom he has performed with several times, including a tour of the US in 2006. “Hanggang meron akong boses at may gusto makinig sa akin, I’ll keep on singing,” he promised with a grin almost as remarkable as his vocals.